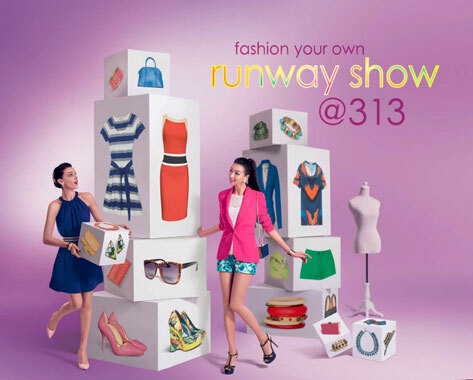 In celebration of Fashion Steps Out 2013, 313@somerset presents Fashion Your Own Runway Show@313. Auditions will be held in search for fashion aficionados with a keen eye for style during the Spring Stylist Search. Trendy individuals will get to showcase their styling talents during the Spring Runway Show. This will culminate in the Grand Finals on 27 April, where participants will work with Elle Stylist Steve Thio to compete for a chance to become the first 313@somerset Spring Stylist winner. Starting from 29 March to 4 April, shoppers who wish to participate in our Spring Stylist Search will have to team up in pairs and submit a picture of themselves in their most stylish spring looks to 313somerset@lendlease.com OR elle_contest@Mediacorp.com.sg (Subject header “313@somerset Spring Stylist Search”). Final on 14 April, where they will have to pick the clothes from participating retailers in 313@somerset and compete under time pressure by dressing the mannequins in fashionable outfits. This will culminate to a Spring Fashion Runway Show on 27 April. Spring Stylist hopefuls will work with professional stylist, Steve Thio, to dress models who will hit the catwalk on a glamorous runway show, bringing style interpretations to life. The winning team will walk away with $1,000 worth of shopping vouchers and a year’s worth of ELLE Magazine subscriptions each. In conjunction with the fashion season, 313@somerset invites Facebook users to its Facebook page (www.facebook.com/createyourlookbook) to create their very own digital look book. Call for submissions will take place from 15 – 30 April, followed by an online voting contest from 1 – 11 May during which shortlisted Look Books will compete for votes! These Look Books can be shared with friends online. Come 12 May, the overall winner determined by voters to be the best portrayal of Spring fashion and garnering the highest number of votes will win $300 worth of 313 shopping vouchers and bragging rights. 3 random voters will also win $30 worth of 313 shopping vouchers. Shoppers who spend $300 can sign up for a wardrobe workshop conducted by a prominent fashion stylist on 4 May, imparting tips and tricks on how to create a fabulous line up of outfits by pairing old with new! Registration will be available at the Concierge Desk at B1 from 29 May onwards. With the qualifying spend period from 29 March to 26 April. CLUB313 members only need to spend $250 to qualify. Seat availability is limited to only 30 people per session so hurry and register! From 28 March to 18 April, those who charge a minimum of $300 to their MasterCard® can redeem $30 worth of 313 vouchers. This is limited to the first 100 shoppers per week on a first come first served basis. From 19 April to 12 May, those who charge a minimum of $300 to their MasterCard® can redeem $30 worth of 313 vouchers, on a first-come first-served basis. Tring 313 users are entitled to a $10 313 voucher when they spend $120 at any 313 outlet from 29 March to 12 May. Shoppers must download the Tring 313 iPhone app, download the exclusive Spend & Redeem coupon, and present together with receipts at the Concierge Desk at B1. Limited to 100 shoppers per week. For more information, shoppers can enquire at or call the Concierge Desk at 6496 9313 or log on to the 313@somerset website www.313somerset.com.sg.